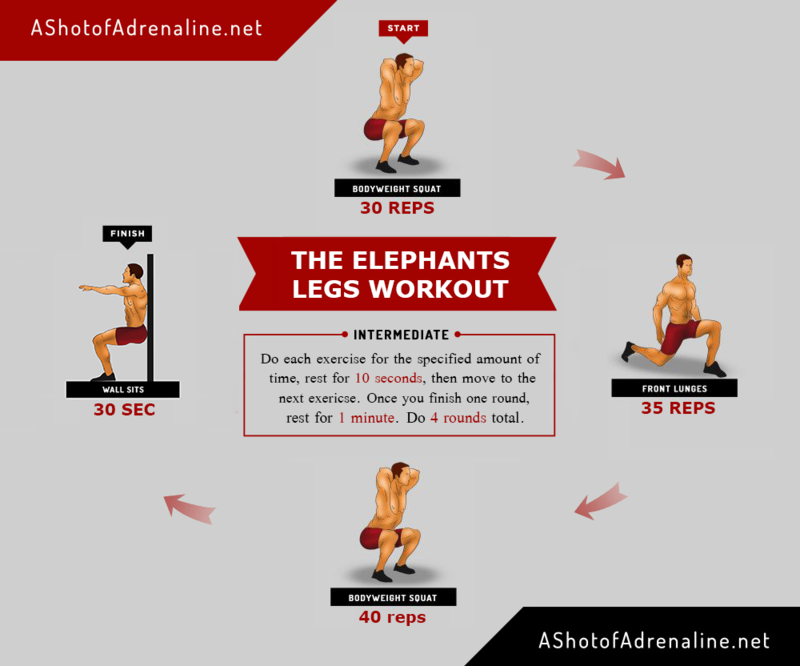 This workout is all about giving your legs the strength of Elephant Legs. Elephant legs are solid tubes of Pure Muscle. Well, not pure muscle, there’s a lot of fat in there. But for the purposes of this workout we’re going to focus on the muscle part. Elephants can carry up to 19840 lbs on top of their own weight which can get up to 14000 lbs. We don’t promise you’ll get any where near that kind of strength, but human legs can do some absolutely impressive things, and with enough practice, you can get there. This could be the first step to that kind of strength. Do each exercise for the specified amount of time, rest for 10 seconds, then move to the next exericse. Once you finish one round, rest for 1 minute. Do 4 rounds total. Instead of regular squats, you can do pistol squats. Feel free not to reach the specified amount of seconds and reps, as long as you’re giving it your all.